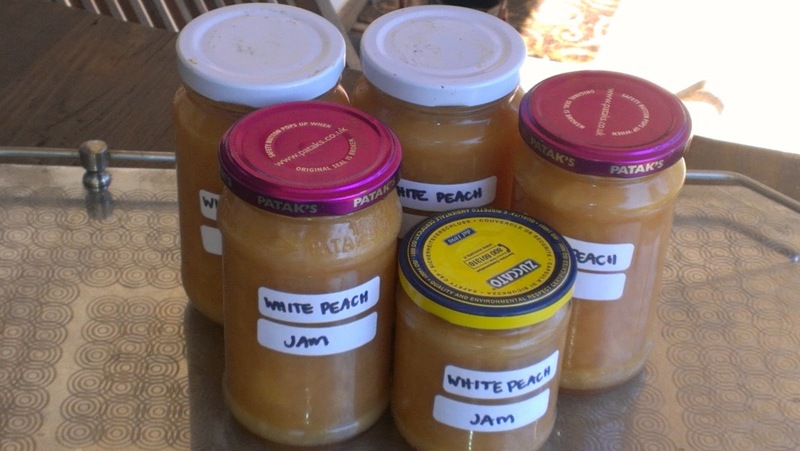 I made loads of jam with our plums again this year. And I have given most of it away to friends too. We hardly ever actually eat jam. I got a dehydrator thinking I would put it to use on our plum glut. And then I found out our plums are not good for drying - way too tart. Have you thought about dehydrating? Dried peaches are yummy. Hi VG. I have thought about drying (haven't bought a dehydrator yet) but these peaches are not really suited to drying. They are very very juicy and they are strongly cling stone and so too hard to work with. I have 4 peach trees which seem to be 3 varieties , some cling stone and some free stone. Now that I know this I will be able to plan my glut a little better. The free stone for drying and bottling, the cling stone for stewing, all for eating, jam making. Wow - what a gorgeous peach glut. 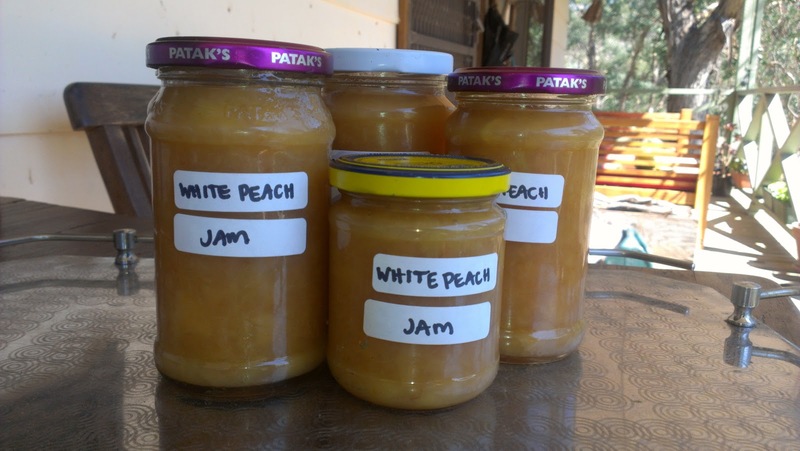 I love the idea of peach jam. 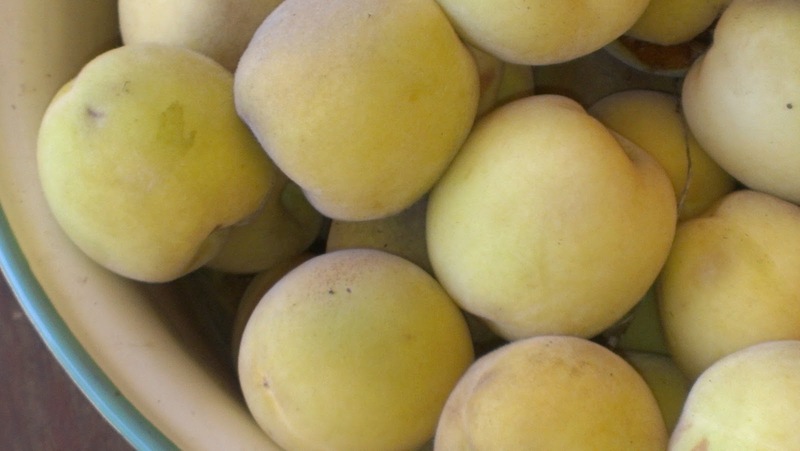 Would they be suitable for peach sorbet, if you have the freezer space? I would also be dehydrating, even though they are clingstone, as I just cut around the stone with mine - yes, you end up with two nice round peach shaped side and two short sides, but I find they dry well. Especially when there are so many! I wish I had freezer space cause peach sorbet sounds heavenly! I am getting a new fridge, I have quickly discovered that in the country larger freezer space is really important! I have had a couple of years that I had so many pears that I had to do this. Now,if I could only find one of those groups that trades their home-canned produce so I could obtain some of the things I want, and they could have some of my jams. What a great idea! A trade! I preserved quite a lot of peaches in fowlers jars this year. The kids really like them but and they preserve quite well even just in water. I will be interested to see how often we use them. I should have tried bottling the freestone ones I had earlier in the season - these ones are too squishy and juicy!